Don't worry, there will not be a third addition of this feature as the predictable Dienhart doesn't deserve another response after this one. Here is his newest rankings. Jags comes in at 11. A big jump from the 12 spot Dienhart gave him last year. The biggest surprise is that Dienhart actually moved TOB down one slot from 3 to 4. I guess a 5-7 season will do that. However, Dienhart is still steadfast in his support of TOB. Just imagine if Notre Dame or Washington had hired him. I still think it's a lead-pipe cinch that O'Brien will have the Wolfpack playing in the ACC title game within three-to-five years. Because these things are so subjective, I tried to put some real measurements to them last year at AOL. He's familiar with the terrain at The Heights. And his NFL background will make him attractive to recruits. But can he run the whole show? The jury is out. But know this: Jags inherited a loaded deck and needs to win big this fall. And if he tastes success, will he bolt back to the NFL. He enjoyed a wildly successful debut season. Now, the hard part: maintaining the level of excellence. If he backs up last year's magic with another contending team, I'll stamp Jags as "legit." Fair enough. He wants to see Jags do it again. All BC fans do. 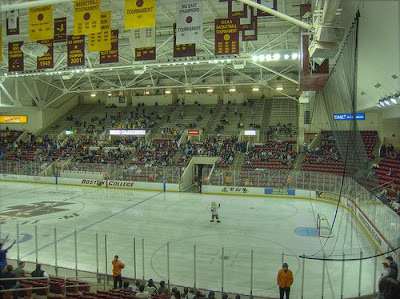 But don't you have a funny feeling that if BC goes 14-0 next season, Dienhart will still be saying "yeah, but..."
This is a clip of Whitney's goal via someone recording it off of SportCenter. Not the best shot, but a good enough view for those who missed it. The draft is still weeks away, yet somehow Ryan and Tribble are falling. Ryan is a top 10 pick. No way is he slipping past Baltimore. Tribble is another story. I have no idea where he'll go. Some of you may have seen this, but the former coaching staff is also blackballing him to the NFL. Minnesota may trade up for Ryan. Here are a few more links on Reggie Jackson. I cannot wait to see him do his 360 dunk at BC. The game was really the story of four different periods. BC looked sluggish early. They dominated the final minutes of the second of period. 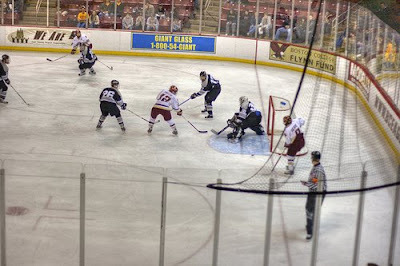 Got outhustled in the third...and just when it looked like it was all slipping away Jerry York called a timeout in OT. Whatever he said worked, as the team came out of the break attacking. Joe Whitney sealed the deal with a flicked in rebound at 12:12 of OT. 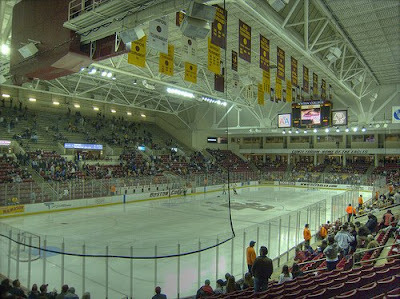 Back to the Frozen Four! Like our other recent events, I recommend students make the trip. For fans and alumni in Colorado, contact BC about tickets. The team beat Minnesota tonight to advance to the regional final against Miami of Ohio Sunday. The win was Jerry York's 800th victory. Strong performance overall, and of course it included a weird final few minutes due to a delayed replay. (Was I the only one convinced that things were going to fall apart once they put all that time back on the clock?) 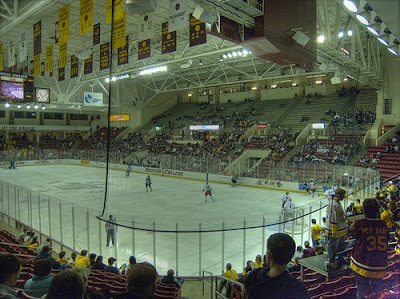 Despite the second chance given to the Gophers, BC held on and added another empty net goal. If you have the time head back to Worcester Sunday and cheer on the Eagles. 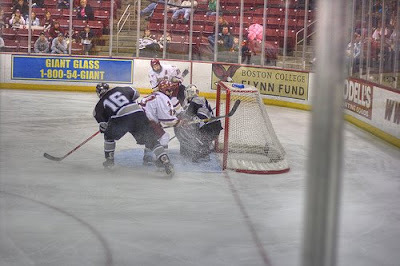 Here is a local angle on BC goaltender John Muse. NFL.com has posted their player profiles for prospective draftees. Here is Ryan's and Cherilus'. Q: What coach had the most impact on you? A: My offensive coordinator at Boston College. He was a drill sergeant, a real stickler, disciplinarian. His name is Tom Coughlin (now the Super Bowl champion New York Giants’ head coach.) I learned more football from that man. After working for Tom and learning it his way, everything else came easy. The ACC has added another bowl to our postseason line up. Doesn't D.C. sound better than Boise? Future BC football player Kaleb Ramsey is also a pretty good basketball player. After watching North Carolina spank Washington State last night, my mind wandered to BC's upset in 1994. Here is the SI article on the game. While searching for this article, I came across this Leigh Montville piece on Dan Henning's arrival. 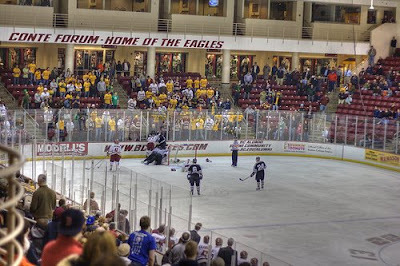 A very good post by BC Interruption on our opponents in the opening round of the NCAAs. 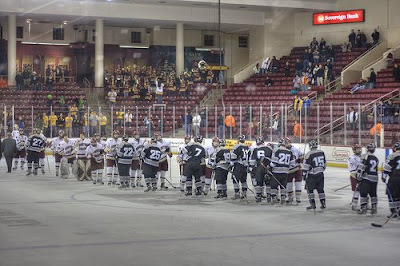 Additionally, Boston College Athletics will be sponsoring a bus service will be provided service to provide transportation for students from campus to the DCU Center in Worcester. You may also sign up for this at the ticket office Tuesday. This service is free of charge. Whatever you might be doing this weekend, won't be as memorable as the game. Even if the buses fill up, go on your own. Get some friends together. Buy scalped tickets. I don't care if you haven't gone to one game all year. I don't care if you don't like hockey. Go! It will be fun. Enjoy yourself and support the guys. Here is the latest entry in Matt Ryan's diary for Fox. SI recently opened up their archives, so I'll be selecting memorable articles for the links on a regular basis. Here is one on Mamula's combine. Although he played a different position, it is interesting to compare it to the scrutiny that Matt Ryan is going through now. Two future Eagles, Reggie Jackson and Dallas Elmore, made the all-Colorado team. 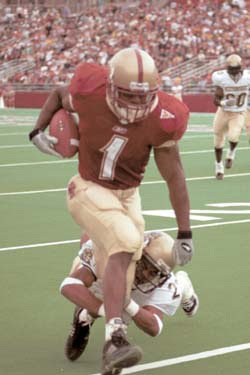 Want to know the consensus on BC football heading into their first season without Flutie? Read this Sports Illustrated preview of the team written in September of 1985. BC finished 4-8. It is telling that even after another season of basketball, a google image search produces the same pictures of Tyler Roche. Instead of being a coming out year, Roche stagnated. By the end of the season his regular minutes were gone. Roche is out there to hit perimeter shots. He made a few but was mediocre for the most part. His 3-pt percentage of .338 trailed Rice, Oates, Sanders and Raji. He's supposedly a good foul shooter, yet he only made five of his 11 attempts. I don't know what frustrates me more: 1. that he only got to the line 11 times or 2. that he didn't bury each shot. I'd like to point out the positives but there weren't many. I guess you could say his early season play was better. Does that offset his lackluster play down the stretch? On the defensive side, you could point to his improved rebounding, especially on the longer rebounds. I still believe Roche has some tools and value. But the clock is ticking. He still hesitates to take open shots. He never drives towards the basket. That can't happen next year. It will be interesting to see what happens with Roche. Speculation is that he is coming back. But to do what? Unless he makes major improvements, I don't see him getting much playing time next season. The Offensive Line is where Jags made his reputation. Yet last spring a scheme change, a staff change, and replacing a few TOB starters created more confusion than cohesion. Things should be different this spring as the team has a full season in this zone scheme, a full year working with Jack Bicknell Jr and more of Jags recruits moving into the Oline depth chart. This year Jags had the luxury of keeping one side of his line intact. With Matt Tennant, Clif Ramsey and Anthony Castonzo returning, Jags had his C, RG, and RT. However, reading this Globe article, it looks like he is going to move people out of their respective comforts zones and into new positions. From what Jags outlined, only Tennant would remain in his 2007 position at Center. Castonzo's potential move from the right side to the left is hardly surprising. The Left Tackle is the most important spot on the line. Castonzo is our most experienced tackle and potentially our most talented, so it makes sense. Keeping Tennant in place at Center almost makes as much sense as moving Castonzo. Tennant played well last year. His ability to call out protection at the line will be important with a new QB behind him. Also, Tennant is too small to play the other tackle spot. The welcome news is Jags projecting Rich Lapham as a starter at Right Tackle. The highly-touted New Hampshire product has been somewhat of a disappointment early in his career. 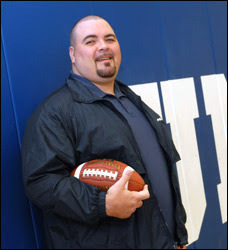 His size and style were more suited to TOB's Gigantor philosophy of offensive line recruits. Slimmed down and more polished, perhaps Lapham is ready to fill his potential. Jags hinted that the guard spots are wide open. Curiously neither he nor the Globe's writer mentioned Clif Ramsey. Last year's starting Right Guard struggled early in the season, but played well in the final four games. I assumed he would be a sure thing at Right Guard and even a potential candidate at Right Tackle. Despite the slight in the article, I predict Ramsey will be starting this fall. That leaves one true opening -- the other guard. The likely names to fill this slot are Sheil, Richman or Spinney. Or Jags could convert one of the defensive linemen (Rossi?) or consider the recently converted (Claiborne?) for the open position. This could all change. Just look at these pictures from last fall. Jags was juggling his starting line in August even as the season approached. 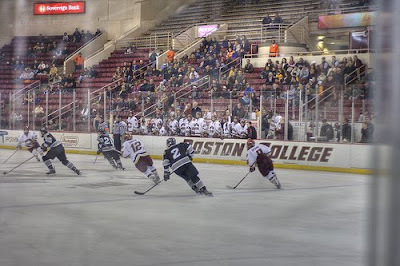 Regardless of who is where, the line must play better if BC wants to win the division again. In a season of letdowns, one of the bigger disappointments had to be the play of Tyrelle Blair. The knowns before the season: Blair's shot blocking. The unknowns: could he become a great defender and offensive contributor? Despite being named to the All ACC defensive team and leading the conference in blocks, Blair did not take his D to the next level. And his O never became consistent. Blair does deserve some credit. His shot blocking did alter a few games in BC's favor. His 11 blocks against Maryland will go down as one of the best single-game defensive performances in BC history. As for scoring, Blair was solid from the line and did a decent job finishing open looks. Blair never became the rebounder we needed. As Raji and to a lesser extent Spears showed, putbacks are common place in our style of play. Yet Blair rarely got in the mix. And when he did go up, he lacked the touch and strength to finish well against big bodies. Blair also made some troubling errors when tyring to be a post player. Too often the ball would go into him with his back to the basket and he'd force a bad pass or bad shot. I also think the losing affected Blair. 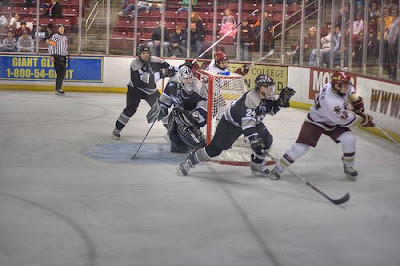 He lost his cool against Robert Morris and then seemed to check out during the late season skid. I thank Blair for his time and contribution to BC. His play at the end of last season, including his game winner at Florida State, will always be remembered. At times, he changed games with his swats. Even if his senior year fell short of expectations he had his moments. Best of luck to him in his post BC career. 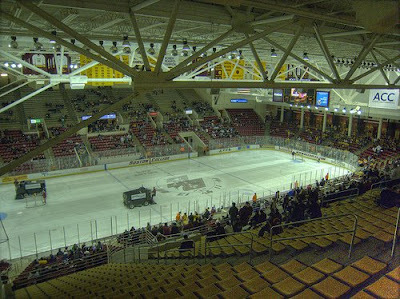 BC beat UVM tonight (we've read that before) to advance in the Women's NIT. Next up: St. John's on Thursday night. The women's basketball team starts their NIT campaign tonight against Vermont. You can watch the game on ACCSelect. With spring practice starting this week, Rivals has a look at the issues facing BC. Despite this blogger's lukewarm take on Tribble, Tampa Bay is considering taking him in the draft. 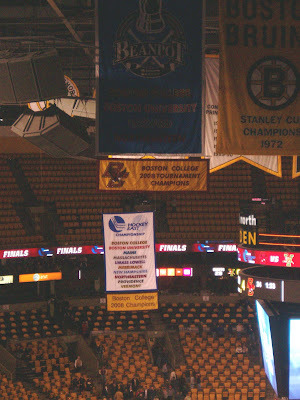 Thanks to Meredith C. for capturing the moment as BC's championship banner joined the more famous flags at the Garden. 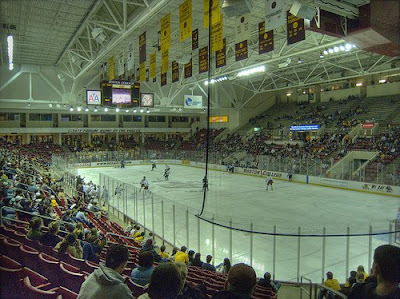 Here's an overview of the NCAA Hockey tournament. 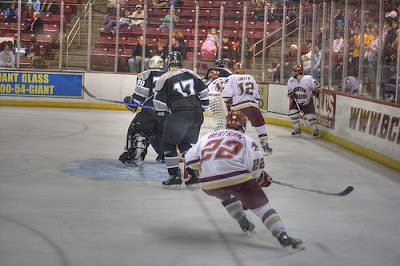 BC kicks off its push for the title this weekend in Worcester. Ryan had one of the higher Wonderlic test scores at the NFL Combine. Cherilus is getting more and more attention. Here is more on William Green's attempt to get back into the NFL. 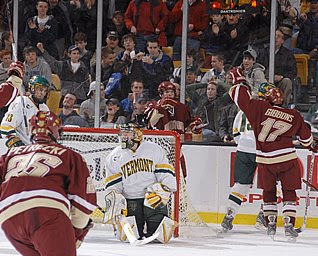 John Muse prevented any BC hangovers from Friday's triple overtime marathon by shutting down UVM in the first period. His fellow Eagles matched his strong strong play (an eventual shutout) in the second period and then held on for a 4-0 win. 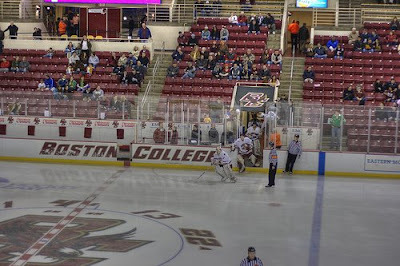 It is BC's third Hockey East title in the last four years. Congrats to Jerry York on another trophy and for getting the team to peak at just the right time. 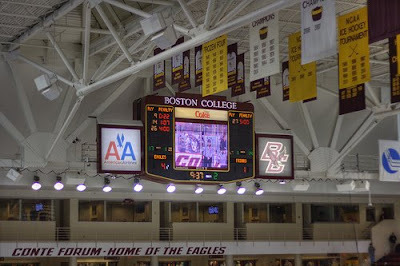 BC has now won the Beanpot and the Hockey East titles. They last time that happened was 2001. Not to jinx us, but in 2001 we also added a pretty big third trophy before the year was over. Benn Ferriero ended a long, long game with a goal in the third OT. 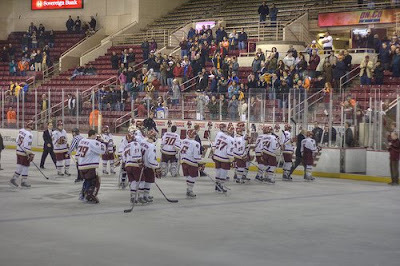 BC beat UNH to advance to the Hockey East final Saturday night. BC is promoting Nathan Gerbe for the Hobey Baker award. A BC blogger was already on the case earlier this winter. 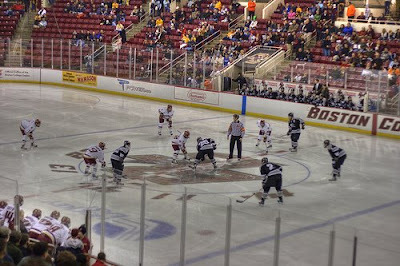 Here is another article on Fenway Sports Group the marketing arm for BC sports. Incoming BC basketball player Evan Ravenel is part of the All Florida team. His future teammate Reggie Jackson was named the Gatorade player of the year for Colorado. 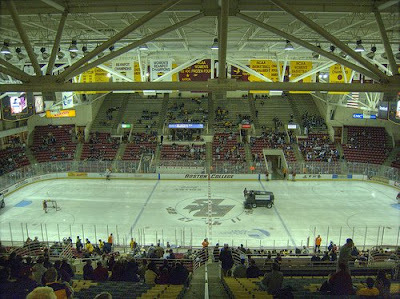 Tonight BC takes on UNH in the Hockey East Semis. The winner of tonight's game will play the winner of the BU-UVM matchup. The baseball team started strong in their series with Virginia Tech. Satirical NFL blog Kissing Suzy Kolber gives their own unique scouting report on Matt Ryan. Corey Raji had one of the more interesting seasons on the team this year. The first few games of the season were unremarkable. Then he had a mini-hot streak that included ACC rookie of the week honors in December. His minutes declined with the start of conference play. However, he bounced back and worked his way into the starting line up by the end of the season. The stops and starts of his season embodied the challenges that the team and his fellow freshmen experienced this year. The good news about Raji’s play down the stretch is that he performed a role we need: the stat filling wing player. He can rebound. He can get those garbage points that come out of Skinner's offense. He understands the flex and he’s a versatile defender. While he didn’t take over many games, Raji had the lowest turnover ratio on the team and the third highest rebounding ratio per minutes played (just slightly behind Spear and Oates). Contributions without drawbacks are what keep you on the floor with Skinner. There is always room for improvement. While a good defender, he is far from a shutdown solution (see McClinton in the second Miami game). He, like some of his other freshmen, forced some awkward shots when the team was struggling. Teams will also continue to press BC until someone like Raji can start bailing out our point guards with smart passing and good ball handling. And then there are the free throws. Raji shot an abysmal .556 from the line. That was lower than his actual shooting percentage of .608! With his style of play, Raji will be going to the line often. We can’t sacrifice all those points. His form isn’t bad, so I assume it is just mental and something he can improve. I’ve written that Raji might not have the same upside as Sanders or Southern, but as his first season showed, he can be a very, very good player at BC. Here is the Silva angle on Pro Day. I wonder how much his slow 40 times will hurt his status. This Dallas blogger notes that Ryan and another first day draft pick Joe Flacco were the 44th and 43rd ranked QB recruits in 2003. This little widget is not draft day related, but does show how broad our recruiting reach is. "Those Boston College receivers that he was throwing to, there's not a lot of talent there," he said. "It tells me that Matt Ryan must be a pretty impressive leader, a pretty impressive kid to have won 11 games this year with some mediocre talent around him. And that's taking into account those receivers and those linemen. They weren't much. To win 11 games in the ACC, which is a pretty good league, he must be a pretty good kid and a pretty good quarterback." Boston.com also had a short video of the day. This clip has nothing to do with the draft, but I just came across it tonight in a search. All of this is second hand info from various sources. Take it for what it is worth. Unofficially Matt completed 46 of 50 passes. Feelings were mixed from "pretty good" to "he looked great." Callender was fast and supposedly ran a 4.4. He also looked good catching balls. Hopefully this will get him drafted. Willie Green looked to be in great shape...and then ran slow. Supposedly 4.7. He may still catch on with a team, but he didn't blow people away. Silva looked impressive and has put on good weight and muscle. Gonzo was back to catch passes but struggled a bit. Challenger looked sharp. Loyte -- so, so. Logan ran the offensive drills. Loscalzo ran the speed and strength drills. The Globe has a rundown of all the NFL folks in attendence. Of note, Herm Edwards and Matty shared some one on one time after the throwing session. I'll post more as I hear it and will hopefully have some pictures later tonight. Hats off to Barry Gallup and Gene as everyone said it was well organized, professional and made BC look good. Yesterday's post on the ACC teams generated a few emails about who I was actually rooting for this year. 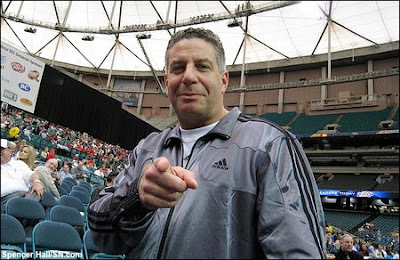 I hopped on the bandwagon of the original SuperFan Bruce Pearl '82. He's a BC Guy whose teams play an exciting brand of basketball. He's also winning at a school with a dormant basketball tradition. If it can't be Al cutting down the nets, it might as well be another Eagle. The women's basketball team is headed to the NIT. A disappointment for sure, but this young team has a very bright future ahead. With their returning players, I imagine they'll be a preseason Top 25 team. BC is celebrating all women's athletics April 26. All former female student-athletes of Boston College are encouraged to attend the celebration. Here is a look at incoming offensive lineman Mike Goodman. "I'll tell you who [Ryan] is," Jagodzinski told me Friday. "Matt Hasselbeck. The way he carries himself, commands the huddle, competes, is hard on himself. He's got it all. All those teams talking about Matt [Ryan], saying, 'Yeah, but ...' would all line up to get Matt Hasselbeck right now." Matt is continuing his diary for Fox. Important notes: he's working with fellow BC Guy Mike Kruczek and he likes Union Street in Newton Centre. Ryan's near future is set. He is going in the first round and will get a chance to start in the NFL. A guy whose future is not as certain is former Eagle William Green. Green's Pro Day marks a return to Boston and an interesting twist -- since he's already been a first-round draft pick. He's trying to mount a comeback and claims to have his much troubled life in order. I wish him the best of luck and I am glad to see BC give him this chance. Because of BC’s newbie status within the ACC, I am sure the following will be viewed as sour grapes and envy. It’s not. Location and conference affiliation led me to see plenty of ACC basketball this year…and I just wasn’t that impressed. Think of me as the Anti-Billy Packer. I think the conference is solid but filled with flawed teams, including those at the top. So keep the following in mind as you fill out your brackets. Overview: The No. 1 overall seed. The Tar Heels are loaded with talent, capable of big runs and led by an experienced, National Championship winning coach. Many people will pick them to win it all. Why the BC games changed my perspective on them: In both BC games, Roy Williams pulled all five starters because of their lack of effort. Coaches uses those little mental game tricks all the time. Sending a message to your starters in February is smart. However, even in the ACC tournament I saw the same lapses from the Heels. Yes, they won the ACC Tourney, but the games were much closer than any of them needed to be. If the Heels keep letting less talented teams hang around, eventually they will get burned. The other source of doubt about the Heels comes from Tyrese Rice’s 46-point outburst against UNC. If Rice were surrounded by just a little more talent, BC would have won. Come the second or third round, the Heels will come across another Rice-type (Chris Lofton, perhaps?). Only this time them won’t advance. Pick: I have UNC in the Elite Eight. Their talent should get them that far. They won’t make the Final Four. Overview: After a down year, the Dukies are back. They shoot well. As much as I hate to say it, Coach K is probably the best coach at in-game adjustments this time of year. They also have a very, very favorable bracket. Pick: The Blue Devils have a very favorable bracket, but I could see them losing to West Virginia in the second round. I think they will definitely lose in the Sweet 16. Overview: The best Tiger team in a decade comes in very hot and with a lot of confidence. The are physical, athletic and play great D. Their pressing style will drive teams nuts in the tournament. Why the BC games changed my perspective on them: Clemson just beat BC 84-48 last Friday. They dominated every aspect of the game. I should be high on them right? I’m not. The whole vibe of the blowout – especially continuing to press late in the game – had a vibe of a team and a coaching staff not pacing themselves. This weekend Bobby Knight was talking about how when any game was in hand he would immediately start prepping for the next game. Knight has many faults, but he knows how to win tournament games. I think Oliver Purnell had his team peak a week too soon. Pick: Clemson’s bracket is brutal. Villanova will be able to handle the press. Vanderbilt, a potential second round opponent, is also experienced breaking the press. I see Clemson getting knocked out the first weekend. Overview: A good shooting team that comes into the tourney winner of seven of their last 10. Their RPI is strong and they have wins over Duke and Clemson. 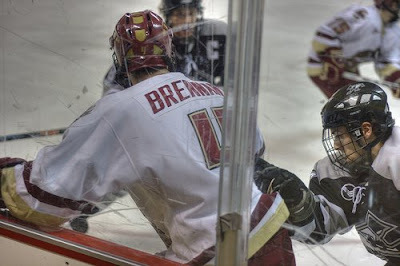 Why the BC games changed my perspective on them: BC split their series with Miami this year. The second game -– which Miami won -- is what gives me concern about the ‘Canes tournament prospects. BC was floundering coming into the game and Miami let them hang around. This team that shoots well got cold against a bad team and only won because BC missed too many foul shots. Pick: Pretty simple...they are not getting by Texas. 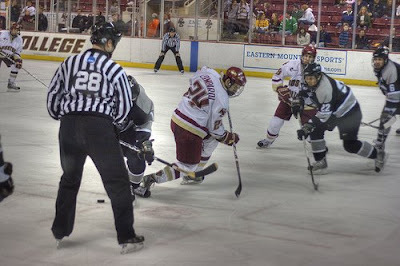 Chris S. did a great job capturing the action from the second game of the Hockey East playoffs. Most exciting play in hockey! 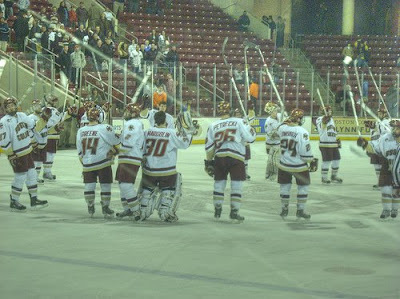 BC won again and will face UNH a to be determined foe next in the Hockey East semis. 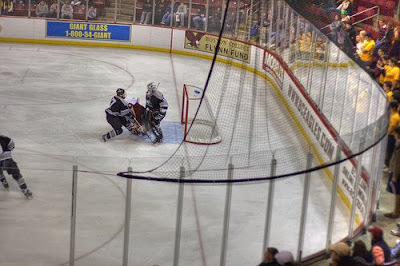 Chris S. got this shot of Gerbe's penalty shot. Go BC! Get on the hockey bandwagon now. Thanks to Chris S. for sending along these shot. Dissapointing turnout but overlapping with the basketball game didn't help. That stunk. The team did a 180 from Thursday. Everything sucked especially the effort and execution. I'll start the post mortem on the team and season next week. Good news: the hockey team won. First let me answer my own question. Clemson is very good. They are favored by 9 and killed us in our last meeting. That said, they are beatable. If you look at the Tigers' profile and season, you'll see that they are strong on both ends of the floor. Their perimeter D is strong and they block shots too. Last time around we even had a few shot clock violations just trying to get something set up. To beat them tonight, we need to remain patient but also move and rotate the ball more effectively. The other aspect of tonight's game that gives me hope is Clemson's road record. Away from Littlejohn, they are only 6-6 against BCS teams this year. Although it is a national broadcast that most of you can see from your couch, it is always fun to watch BC with other eagles. I didn't make the Atlanta watch last night, but BC Mike reports there was a hardy "We ARE BC!" 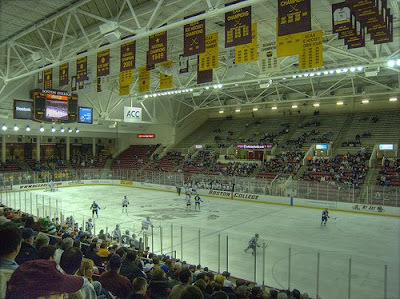 chant in the closing minutes. If your local alumni chapter is having a game watch, let me know or post the information in the comments section. BC Basketball is not the only group of eagles in a tournament this weekend. 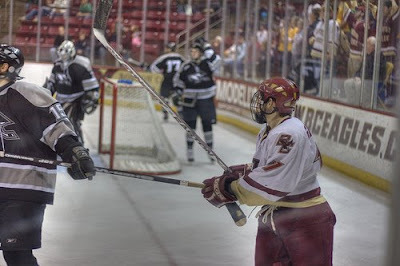 The hockey team is looking to end their recent skid and capture another Hockey East crown. This was the effort we've been waiting for the past six weeks. The game seemed over at two different points: down 15 in the first half and down 11 early in the second. Yet the team showed confidence, patience and poise. We live to play another day. Hats off to the four freshmen. They all played really smart basketball and made up for the lackadaisical efforts from Blair and Oates. I also want to recognize Shamari Spears. He gave us exactly what we needed off the bench tonight. The team defense was better than it has been all season. They rebounded well, didn't lose people with trade offs and were opportunistic in their steal attempts. I hope this encourages Rice to stay. Since our seniors were non factors, I think this shows what our returning nucleus can do next year. Clemson is very good, but I like our chances coming off a win like that and playing in the late night slot again. This might be the last game of the season so you might as well spend it with other BC fans. If your local alumni chapter is having a game watch, let me know or post the information in the comments section. The game is scheduled to start at 9:30 ET. Here is the affliate list. If you're blacked out, you can always use ACC Select or ESPN 360. Since I am a skeptic and critic of the football recruiting rankings, I felt it was only fair to ask one of their own a few questions about the process and BC's place in it. Thankfully Scout.com's Bob Lichtenfels took the time to answer a few of my queries. Lichtenfels, a former high school coach, covers the Northeast for Scout. Below are my questions and Bob's answers. 1. Traditionally Rivals has given BC higher marks than Scout for overall class recruiting. This year was different as Scout had BC at 22 and Rivals ranked BC 33rd overall. Was there something about the makeup of this class that had it score higher in Scout's methodology than it has in the past? Bob Lichtenfels: The short answer is that this Boston College class just had more talent than previous classes. We have hired more people in our regions and when you have more scout’s out in the field you get a chance to see more kids our rankings have also been effected by the fact that our star rankings have increased slightly over the past few years, so you now have a lot more kids being ranked than in previous years. We’re not in competition with our rankings against anyone; we don’t compare and contrast with what Rivals, ESPN or anyone else does. Honestly I would not have even known if you did not mention it to me. 2. BC will have a small signing class for 2009 (probably less than 18). How high can a class that small even move in the rankings? BL: I think Ohio State and USC showed this year that a class can be small, but can still measure up with anyone in the nation. They both finished in the top ten and signed less than 20 players. 3. Now that Jags' staff has been in place for a full cycle, what sort of things are you hearing about their efforts? What sort of impression are they making on high school coaches and players? 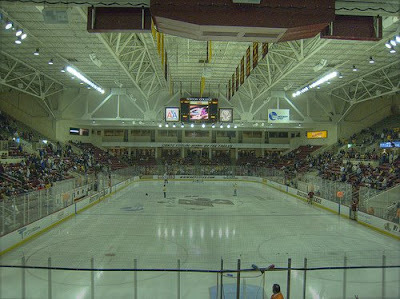 BL: Boston College has been doing an outstanding job early on, especially in Virginia. Top kids like Logan Heastie and Tahj Boyd really like the straight forward approach by Jags’ and his staff. 4. What is the biggest misconception about football recruiting news/reporting/ranking? BL: I think the biggest misconception is rankings. Parents and kids feel they won’t be recruited unless they are a four star on one of the recruiting sites. Coaches don’t recruit based on how many stars a kid has. They separate you into two basic groups offer or no offer. Stars are fun to talk about, but that is about it. I personally would rather evaluate a player and that is it, assigning stars is not something most of us cherish. The other biggest would be something you mentioned and that is how come the so-called name school always finishes higher. That’s pretty simply answered how many times do you see BC play for a national title? How many times do you see Ohio State, USC, Florida, LSU? I mean there is a reason why they win and there is a reason why their rosters are stacked full of elite prospects. Most of us work in the business because we have a passion for it and we are good at it. Some people may have agenda’s or do it for the wrong reasons and we all get lumped together and that to me is the biggest misconception about what we do. Does anyone know what to make of Maryland? They are easily the most unpredictable team in the conference. I think we have a very good chance of beating them Thursday, but wanted a different perspective on the game, so I asked Esquire from Turtle Waxing to answer a few questions about his team. 1. Maryland comes limping into the ACC Tournament, losing four of their last five. What happened? Can the team that collapsed against Clemson and UVA bounce back? and drive to the basket. Burney is a defensive specialist and rebounder. Bowie could be a wild card in this game. He has averaged 13.5 points in his last two games. 2. Vasquez was the key for both teams in the first two meetings. His fouling out led to BC beating Maryland in December. In the second meeting BC didn't have an answer as he repeatedly drove to the basket. What teams have slowed him down and what is the best way to neutralize him defensively? TW: He has scored in double digits in 24 straight games so holding him to a low scoring night won't be easy. His major weakness is his outside shooting and turnovers. Defensively it is better to sag off him when Maryland runs a high screen and let him take a 3-point shot than to allow him to drive into the lane and create havoc. He isn't a great shooter and probably is doing the defense a favor when he shoots more than a few attempts from beyond the arc. In the half court sets it is best to overplay him when he is off the ball to deny him possession. The rest of the backcourt is unlikely to do much damage with the ball in their hands. The help defenders need to challenge Vasquez on the dribble as soon as possible and contest the passing lanes. He may beat the double team sometimes but you'll also get turnovers. 3. During a down season, critics naturally come out. Two big gripes for Skinner haters are the flex and our terrible season. Skinner apologists (like me) point to Maryland as a sign that the flex can win a championship and that even programs that have won a championship can have down cycles. What are the general feelings on Williams now that the National Championship glory has faded a bit? TW: I think there has always been grumbling about Gary Williams. There are a cadre of Maryland fans who labeled him "just" a Sweet Sixteen coach before the national title. They are still around. The boosters that really matter are still firmly in the Gary Williams camp but a few more NIT seasons could change that rather quickly. It is probably undeniable that Williams took his foot off the gas a little since the national championship. The recruiting has been sub par since then and not up to the level that you would expect for a program with the tradition and resources of Maryland. Williams has never liked the recruiting game but I think he has realized that he needs to put more effort into it. You need a certain amount of talent to run the flex effectively and it takes younger players at least a full season to run it effectively. With a young roster that can be a real challenge and that is what you are seeing with both BC and Maryland this year. For most of the teams at the bottom of the league it is either an injury issue or talent gap regardless of the style of offense they run. With good players the flex can work. In my opinion Al Skinner is the fourth best coach in the ACC behind three coaches that have all won national championships. 4. What is your predictions for Thursday? TW: I really don't know what the psyche of this team is at the moment. I have less confidence in a prediction for this game than almost any match up this season. Both teams have struggled lately but since Maryland has a better road/neutral record this year I'll predict a close win by the Terps. You have to think Rice will surpass the 13 points he had in the last game against Maryland so if he can get some help from his bench then BC has a very good chance to pull an "upset" in this game. For more on Maryland, check out Turtle Waxing. The ACC named Rice all first team. He was the second leading vote getter after Tyler Hansbrough. Tyrelle Blair made the all defensive team. Blair was a very good shot blocker, but I think his overall defensive ability was overrated. Jeff Goodman -- whose weekly ACC column in the Herald is a must read -- really captured Rice's frustration with the season. Interesting that Rice points to the first VT game as a turning point. It felt like one at the time. We let that game slip away and then faced down the best teams in the ACC. We never pulled out of the funk. Given how downbeat Rice seems, some would speculate that he will bolt after the season. Yet nbadraft.net, which includes underclassmen in their mock drafts, doesn't even have him in the second round. If his prospects are that borderline, staying in school would make more sense. Despite sputtering down the home stretch, BC lives to play another day. The Eagles will take on Maryland in the late game on Thursday. The teams split their two regular season games. Considering the finish and our seeding, I actually bring some optimism into this game. We match up well against Maryland. The Terps have lost four of their last five. The freshmen are playing well. Who knows? Stranger things have happened. I'll have more on the game this week. I should just repost one of the quick recaps from the past six weeks since it was more of the same today. Decent first half followed by a second half where things got away from them. I hoped for big days from Oates and Blair. We just got average days from them and it wasn't enough. There was encouraging play from the young guys. Raji and Southern now seem to get "it" on the offensive end. They should both thrive within the offense next year -- with or without Rice. Sanders was hot and did a better job handling the ball. Rice seems worn out. The most intriguing aspect of the whole day was Roche's 1 minute and Spears' DNP. With the new faces coming in, I wonder if one or both might explore transferring. The ACC tourney may be Rice's last game(s) as an eagle. I hope he puts on a show and helps us forget this ugly stretch of basketball. -- Play a strong second half. We’ve seen leads slip away, close games become blowouts, and very few games where we ran away with things. -- Big effort from Blair. I had high hopes for him, but he’s been passive as the season has slipped away. I hope he finishes his career with a statement game. 6 blocks wouldn't hurt either. -- One last Oates 3. The much-maligned big man’s career is almost over. I hope he gets a nice basket or two Saturday. A win on Saturday is important. The 11th place team gets a slightly easier opponent in the ACC Tournament and the 12th place team is not included in next season's ACC-Big Ten challenge. I’ve been pining for a statement game or sign of life for three weeks. Saturday is the last chance. Thanks to Eagle Insider poster KZGOBC for unearthing this gem. We've all known Matt Ryan was a good guy for a few years. Entering the NFL Draft, it seems like the national media is picking up on Matt's winning traits too. This article fawns over his skills (thanks to Enrico for sending). This article from the Sporting News included good quotes from Purvis and Logan. Jags is also the subject of some positive praise. That picture of him before the Clemson game always makes me smile. Boxers or briefs? That's the question on Grant Wahl's mind after watching Rice light up Carolina. I don't know what Rice usually sports during games. Surely a reader or two does. I'll let you (and Grant) know if I get a solid answer. BC bound Reggie Jackson is coming up big in the Colorado state playoffs. The guys at BC Interuption continued their Eagles in the NHL series. Second half collapses are nothing new. How we lost was. Instead of coming out flat in the second half, we actually extended our lead. We were controlling the tempo. Yet a boneheaded play from Spears and some big baskets from McClinton and the game was effectively over. The analysis is pretty straight forward. -- Southern and Raji getting easy points close to the basket. Even if Rice returns those types of points should be the focus of our offense next season. -- Oates' defense. Give the guy credit. He's trying and he grabbed 8 defensive boards, added a block and a steal. -- Blair and Spears' decisions. We've been known for guys with good basketball IQs. Guys who knew where to be and what to do in various situations. These two were in a fog tonight. I mentioned Spears stupid intentional foul. Blair had a few blocks, but his offense stunk. When he gets the ball in the low block a bad decision will follow. -- Sanders' handle. He has a great frame and could become a very good player, but his traveling is plain sloppy. Some of the calls were borderline, but Rakim is reckless any time he drives while facing the basket. He's much better posting up a smaller gaurd. -- Rice's passive second half. When the game started slipping away Rice never stopped the comeback with a big play. He got Southern involved for some easy baskets, but we needed him to answer McClinton's big baskets. The season that won't end is almost over. Let's hope Senior Day changes the karma and attitude of this team. Based on the tone of most college football pundits you'd think BC was the first school that had to replace a great QB. Just look at what other ACC programs have done replacing their all conference QBs. **2006 and 2002 are not included as the first team all ACC QBs (Ryan and Schaub) returned for a senior season. As you can see, there is no clear pattern on what works are what doesn't. NC State and Clemson turned the programs over to veterans. Florida State followed a Heisman winner with a freshman. Virginia Tech has had the most continuity, yet is not a particularly QB-centric offense or program. My biggest fear is the Jay Davis scenario. Davis, like Crane, was a long-time backup. He struggled and the team went through a QB controversy. I think BC avoids that worst-case scenario regardless of the QB. Our defense alone should keep us above .500 and bowl eligible. Congratulations to Stefanie Murphy (top right). She was named ACC's rookie of the year. Joining her on the all freshman team is Carolyn Swords (top left). Hopefully this is a start of a long successful career at the Heights. Miami is a clear bubble team. They offset a 7-7 conference record with a good RPI of 26. If they lose to BC tonight Wednesday [I am an idiot. Premature posting. ], their NCAA hopes could be over. In a season filled with disappointment we've now become a spoiler. Can this team respond when they have nothing to play for and the opponent has everything to play for? We'll see. The Herald published a good follow up on Rice's day. Encouragingly, Rice professes that he wants to return for his Senior year. I hope he does. Outside of his family considerations (which were discussed in the comments section of Saturday's post), I don't see the benefit of leaving early. If he left now, Rice would be viewed as a small, score first guard by the NBA. A strong Senior season with improved defensive effort will help his stock. Here is the latest on our game against Kent State next year in Cleveland. I think the attendance goals are optimistic especially with the Indians having an afternoon home game a few miles away. As expected the ACC named Rice the player of the week. It was such an awesome display. What a shame that it ended in a loss. Former Eagle Damien Woody is back in the AFC East only now with the Jets. BC students are keeping up the tradition of volunteering over spring break in Appalachia. We haven't even entered spring practices and our QB battle is already gaining attention. I don't think I could be any more effusive than Nessler and Dykes were on the broadcast. Rice had probably the best first half I've ever seen in college basketball. His second half was very good, but not enough to lead BC past the Tar Heels. When the game started getting away from us, I hoped that he'd have one more spurt and get to 50. Likes: In addition to Rice's heroics, there were a couple other good takeaways. -- The guys fed off of Rice and made some good shots (Sanders and Blair were the only ones who shot below 50%). -- They also rebounded much better on the offensive end. Concerns: The defense still lacks. -- Assignments were missed allowing for too many open 3s. -- Each of a big men has major defensive flaws. Blair doesn't rebound well. Oates has trouble with big men who can dribble. And Southern doesn't move enough. What does this mean for next year? This is the question that keeps coming back. Rice's outburst can be a looked at a few different ways. I am sure to him and those close to him, it shows that he has done all he can at this level and is ready to move on. To BC fans, it shows what he could do if he came back for one more season. To Al...I am sure he'd love to have Rice back, but he's just saw Rice nearly break the school's single game scoring record and lose. Rice is a great talent and there are some very promising players on our roster. The key to our success in the next week and next year is getting the pieces to come together and not wasting great individual performances. Oh, and you can't just outscore everyone. You need to play defense too. With all that said, Rice has at least three games left. I hope he goes out with a bang. I am going back to the TV to watch the second half, but I thought some of you might want to leave a comment or two as Rice goes for the record book. This could be something special. Keep your fingers crossed.